The 2014-’15 Golden State Warriors completed a historically relevant season in June — 67 wins, a 10.1 point differential (8th all time), and the second greatest home court advantage in NBA history. MVP Steph Curry completed a signature season, one that has unofficially confirmed he’s the greatest shooter ever. The Warriors were the best offensive and defensive team in the NBA from beginning to end, and between the Splash Bros, the emergence of Draymond Green, and the dream season for Andre Igoudala, it’s hard to imagine Steve Kerr will have a coaching year better than his first. However, the Warriors suffered hiccups in the bloodbath which is Western Conference playoff basketball, knocking them off their historic pace. Golden State’s postseason record of 16-5 is not bad — a title is a title — but falls short in comparison to the truly historically great teams. Matt Zemek and I are taking a look the best single-season teams of all time. Maybe someday these Warriors will crack our lists, but the odds of any teams topping this bunch is slim to none. Baylor humbly retired nine games into 1971-’72 because he wasn’t the same player. The Lakers used that as the ultimate motivation, torching the league with an insane 12.3-point differential and claiming 69 wins. Almost 30 years later, the Lakers were championed by another demonstrative center, Shaquille O’Neal, as well as coaching legend Phil Jackson and a 21-year-old Kobe Bryant. The Lakers won 67 games and took first place in the Western Conference by 12 games. O’Neal was dead set in the prime of his career and bulldozed opponents en route to his first championship: 30.7 points and 15.4 rebounds in 23 playoff games. Bryant (21.1 points) showed flashes of the legend he’d become, and Jackson conquered any chatter about him not being able to win without Michael Jordan. Nearly completing the 1983 postseason “‘Fo, ‘Fo, ‘Fo,” Moses Malone, Dr. J and company formed one of the deepest, most well-rounded championship teams in NBA history. The 76ers won 65 games and finished nine games ahead of the Celtics in the East. When the Bucks eliminated the Celtics in round one, the 76ers seized the opportunity, eliminating the Bucks in five and then sweeping the Lakers. Malone led the team with 26.0 points, 15.8 rebounds and 3.4 stocks — that’s my own term, not a typo (the combination of blocks and steals) — per game in the playoffs. Andrew Toney, Julius Erving and Mo Cheeks all averaged 16 points or more, and Bobby Jones, Clint Richardson and Marc Iavaroni rounded out one of the best teams ever assembled. How can you argue against either of these teams? The 1986 Celtics were the pinnacle of Larry Bird, and possessed the greatest frontcourt ever. Elite passing and rebounding, knockdown shooters at every position, and one of the NBA’s greatest homecourt advantages led to a season for the ages. The 1996 Bulls, meanwhile, won 72 games. 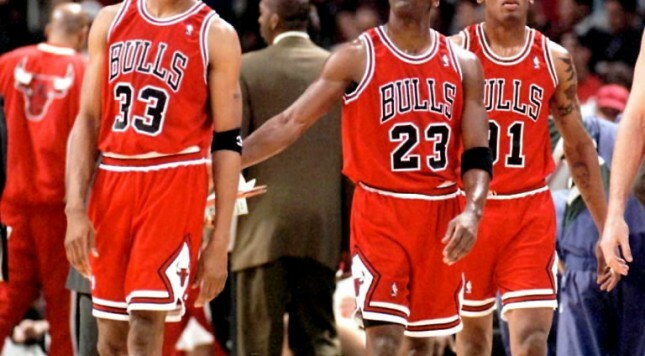 It was Jordan’s comeback season, and the league was shackled to the wall just as it was three years prior, when the Bulls three-peated the first time. So how did I decide? Total loophole. In the first round of the 1986 playoffs, the Celtics played a 22-year-old Michael Jordan. Jordan scored 49 and 63 points, the latter coming in a 135-131, double-OT loss at the Boston Garden. Jordan almost beat the Celtics when his best teammates were Orlando Woolridge and Quintin Dailey. Best Jordan = Best team. Sorry, not sorry. This topic is admittedly somewhat ambiguous, in that a reader could very easily interpret the title as asking not for the best teams within the context of single seasons, but the best seasons themselves. Yes, if we had wanted to be clearer, we would have labeled this article “The 5 Best NBA Seasons Of All Time.” The results from the season would have been a little more central to the rankings; the quality of the team would have been slightly less primary in shaping the final evaluations. The 1967 Philadelphia 76ers had a better season than the 2001 Lakers, and would have made this list had the ground rules been different. However, since quality of team is the (slightly) more important basis for judgment, the 2001 Lakers get the nod. Yes, Wilt Chamberlain finally put the Bill Russell and Boston Celtic demons to rest in that heaven-kissed 1967 playoff run. His team smoked the Celtics, 4-1, in the East finals. Wilt averaged 24 points, 24 rebounds, and 8 assists in a video-game season. Hal Greer joined Wilt in averaging over 20 points per game, and super-sub Billy Cunningham averaged over 18 points per game despite averaging under 27 minutes a night. Chet Walker was a third wheel who averaged 19.3 points per game — not a bad third wheel. As an historical postscript to the 1967 Sixers, four members of that team — Cunningham, Matt Guokas, Larry Costello, and cameo-role reserve Bob Weiss — went on to become NBA head coaches. Two of them — Cunningham and Costello — won NBA titles from the bench. The ’67 Sixers are number six on this list, but not number five. Why? This is where we get down to brass tacks and make the kinds of determinations relevant to the subject matter. The best teams have to be measured, at least to a certain degree, based on the opponents they faced within the context of a given season. In the 1967 NBA, only the Sixers and the 60-win Boston Celtics claimed more than 44 wins. The league was small at that time, sure, but the teams which existed were not, on balance, all that good. The 2001 Lakers were part of a highly competitive Western Conference in which five teams won more than 51 games and seven won at least 50. Los Angeles didn’t dominate the regular season (56-26), but when Derek Fisher returned from a prolonged injury-based absence to play the final 20 games of the season, the Lakers became a superteam. The fact that they went 15-1 in the playoffs and won 23 of their last 24 games of the season offers enough reason to view them as the best of the Shaq-and-Kobe Laker teams and, for that matter, the best of any Phil Jackson-Kobe Bryant Laker team. The Sixer franchise, as you can see, didn’t win strings of titles, but when its best teams maxed out, they destroyed the competition. The 1967 team — with Billy Cunningham as a player — went 68-13 and never lost more than two games in a playoff series. The 1983 team — with Billy Cunningham as the head coach — went 65-17 and never lost more than one game in any playoff series. To be more precise, The 1983 Sixers went 12-1 in the playoffs. Moses Malone joined Doctor J, Andrew Toney, Maurice Cheeks, Bobby Jones, and others to form a juggernaut. Sweeping the Los Angeles Lakers in the Finals affirmed this team’s greatness on an all-time scale. Why is this team not ranked higher? The 1983 Eastern Conference was thin soup. The Boston Celtics won 56 games, the Milwaukee Bucks 51. That was the extent of the 50-win club in the East. The Bucks upset the Celtics in the East semifinals, so the Sixers played a 51-win team in the conference finals. Philadelphia beat a 44-win New York Knick team in the East semis. The Finals revealed this team’s talents, but we’re left to wonder how this team would have fared if it had to play the Celtics in the East finals. The 1972 Lakers rate above the 1983 Sixers because they had a tougher road in the playoffs and were never taken to a Game 7. They never trailed 2-1 in a series as the 2015 Golden State Warriors did on two separate occasions. The ’72 Lakers met and swept a 57-win team (Chicago) in the West semifinals, not the conference finals. Los Angeles then took on the 63-19 Milwaukee Bucks — in their Kareem-and-Oscar golden days — in the West finals. The Lakers handled that series in six, so as a result, the 48-win New York Knicks were comparatively more manageable in the NBA Finals. The Lakers won that series in five. Why are the Lakers below the top two on this list? Very simple: They got blown out three times in the final two rounds of the playoffs. Los Angeles lost by 20 or more points at home on two separate occasions — Milwaukee and the Knicks both ambushed them in Game 1s at The Forum. Milwaukee later beat the Lakers by 26 to even the West finals at 2-2. The Lakers promptly smacked down the Bucks in Game 5 of that series before closing it down in Game 6, and Los Angeles also ran off four straight wins against the Knicks after losing Game 1, but three blowout losses merit a slightly lower placement in these rankings. This, ladies and gentlemen of the jury, is the best homecourt team in NBA history. The 1986 Celtics went 40-1 at home and were unbeaten in the Boston Garden in the playoffs. No NBA team defended its home floor better than this one. The Celtics did lose twice in the NBA Finals against the Houston Rockets, but Boston cruised in each of the first two games of that series, took a 3-1 lead, and then played Game 5 on the road in Houston due to the 2-3-2 format, then in its second year of use. This would have likely been a five-game series under the 2-2-1-1-1 format. Boston easily won Game 6 to capture a comfortable series win. Why are the Celtics not number one? They played a 51-win Houston team without Finals experience. The Rockets — the only Western Conference team other than the Lakers to make the NBA Finals in the 1980s — pulled off one of the great shockers in NBA playoff history by dispatching the 62-win Lakers in five games in the Western Conference Finals. Had the Celtics beaten the Lakers in the 1986 Finals, and they didn’t need some Gerald Henderson-style 1984 heroics to do so, they probably would be number one. It’s not the 72 wins — not entirely, at any rate. The 1972 Lakers won 33 straight, so why isn’t that team in this top spot? You’ve already seen why — those Lakers got blown out too many times in the playoffs. Chicago is number one because the Bulls played better teams in the final two rounds of the playoffs. They swept the 60-win Orlando Magic in the East finals, and they dismissed the 64-win Seattle Sonics in the NBA Finals. Yes, that last series went six games, but the Bulls took a 3-0 lead and were not particularly threatened in Game 6 once they got back home to Chicago. The Bulls would have left no doubt as to their top status if they had swept Seattle — which was an excellent team that season — but their two straight losses offer an argument to the 1986 Celtics, who played in a more exalted era of professional basketball.